India is likely to receive “below normal” monsoon rainfall this year on account of the El Niño weather phenomenon that is sometimes associated with drought in the subcontinent, private forecaster Skymet Weather said in a prediction which, if it turns out to be right, could deal a setback to agricultural output. And if the forecast proves correct, it will be the fourth year since 2014 in which the June-September south-west monsoon falls short of the long-period, or 50-year average. Skymet expects the monsoon to be about 93% of the long period average of 887 mm in the four monsoon months. Last year the monsoon was 91% of LPA — bordering on “below normal”. East India, along with large parts of Central India, will receive deficient rainfall, particularly in June and July when El Niño will make its effect felt. El Niño is a weather phenomenon characterised by warm ocean temperatures in the equatorial Pacific Ocean. El Niño years are characterised by a weak monsoon and more episodes of heat waves. The south-west monsoon accounts for about 70% of India’s annual rainfall and is key to agricultural output in the country, where over 60% of the population is either directly or indirectly dependent on farming for a livelihood. Normal rainfall is defined as 96-104% of the LPA. 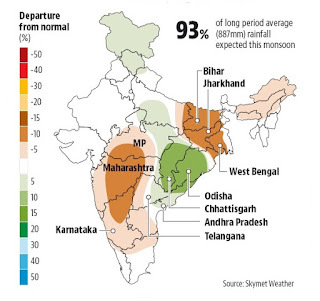 Odisha, Chhattisgarh and coastal Andhra Pradesh are likely to receive normal rains throughout the season. According to Skymet’s regional forecast, West Bengal, Jharkhand and Bihar in the east, and Maharashtra, Madhya Pradesh, Karnataka, Andhra Pradesh and Telengana are going to be particularly dry throughout the season. There is a 15% chance of drought in some of these regions, according to Skymet’s models. In its preliminary monsoon forecast issued on February 25, Skymet had predicted normal monsoon rains. But the scenario changed when its forecasting models showed that moderate El Niño conditions had formed in March and are likely to continue developing until July.